STARWOOD RETAIL 168 • SHOPPING CENTER BUSINESS • May 2018 S tarwood Retail Partners has launched an initiative to add oth- er uses to its portfolio of regional malls. 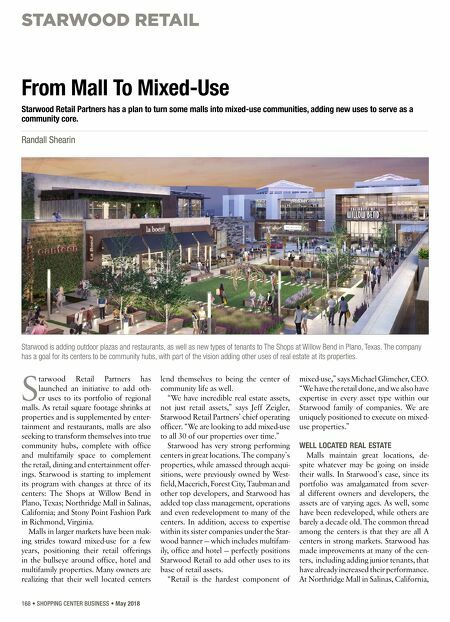 As retail square footage shrinks at properties and is supplemented by enter- tainment and restaurants, malls are also seeking to transform themselves into true community hubs, complete with office and multifamily space to complement the retail, dining and entertainment offer- ings. Starwood is starting to implement its program with changes at three of its centers: The Shops at Willow Bend in Plano, Texas; Northridge Mall in Salinas, California; and Stony Point Fashion Park in Richmond, Virginia. Malls in larger markets have been mak- ing strides toward mixed-use for a few years, positioning their retail offerings in the bullseye around office, hotel and multifamily properties. Many owners are realizing that their well located centers lend themselves to being the center of community life as well. "We have incredible real estate assets, not just retail assets," says Jeff Zeigler, Starwood Retail Partners' chief operating officer. "We are looking to add mixed-use to all 30 of our properties over time." Starwood has very strong performing centers in great locations. The company's properties, while amassed through acqui- sitions, were previously owned by West- field, Macerich, Forest City, Taubman and other top developers, and Starwood has added top class management, operations and even redevelopment to many of the centers. In addition, access to expertise within its sister companies under the Star- wood banner — which includes multifam- ily, office and hotel — perfectly positions Starwood Retail to add other uses to its base of retail assets. "Retail is the hardest component of mixed-use," says Michael Glimcher, CEO. "We have the retail done, and we also have expertise in every asset type within our Starwood family of companies. 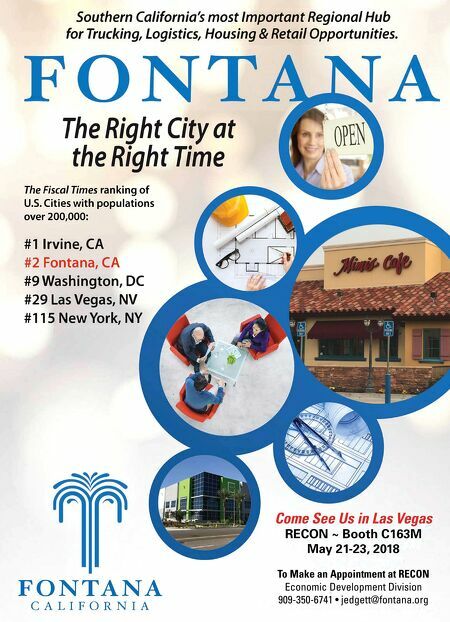 We are uniquely positioned to execute on mixed- use properties." WELL LOCATED REAL ESTATE Malls maintain great locations, de- spite whatever may be going on inside their walls. In Starwood's case, since its portfolio was amalgamated from sever- al different owners and developers, the assets are of varying ages. As well, some have been redeveloped, while others are barely a decade old. The common thread among the centers is that they are all A centers in strong markets. Starwood has made improvements at many of the cen- ters, including adding junior tenants, that have already increased their performance. At Northridge Mall in Salinas, California, From Mall To Mixed-Use Starwood Retail Partners has a plan to turn some malls into mixed-use communities, adding new uses to serve as a community core. Randall Shearin Starwood is adding outdoor plazas and restaurants, as well as new types of tenants to The Shops at Willow Bend in Plano, Texas. The company has a goal for its centers to be community hubs, with part of the vision adding other uses of real estate at its properties.